When men eventually take stock of their present situation they must surely admit that all is not well for humanity. Political, economic, social, environmental conditions are filled with problems which test the resources of all the countries to the limit. Even those countries which seem to be economically dominant at the present time have problems which deny them the ease their wealth implies. What is preventing the nations from achieving a degree of balance and well-being? Why do even old, rich and experienced nations plunge suddenly into chaos and strife? Why the pain and struggle for so many; what prevents a greater sense, and expression, of unity? The answers to these questions are many and varied, but the single inclusive factor is the time, the moment in this Earth’s history, in which they are being asked. In this way, even if unaware of His presence and teachings, they are responding to Maitreya’s energy and influence, and building the framework of the future. Q. How many interviews has Maitreya now given in the USA and Mexico? A. 43 [12 September 2011]. Q. Does He now appear as a solo guest only? Q. (1) Does Maitreya appear during the demonstrations as He appears during His interviews? (2) Did it happen in Cairo, in Tahrir Square? (3) Will it happen in the future? (4) If the Americans begin to demonstrate like in the Arab countries, will Maitreya join them, as He appears on television? A. (1) No. (2) No. (3) No, unlikely. (4) Maitreya uses a multitude of guises suitable for each occasion. How else would He retain His anonymity? Q. The world’s economic state seems more unstable and unsustainable than ever; can you comment on the current crisis? A. This economic crisis, worldwide, is inevitable. It is a symptom of the fact that the old economic principles, which have been in force for several centuries now, no longer work. The world has changed, the hearts and minds of men everywhere have changed – more or less – and the countries making up the whole are at too disparate levels for the economic cohesion essential for stability. It is a sure sign, predicted by Maitreya long ago, that only sharing and justice can provide the right way into the future. Q. (1) Will raising the US debt ceiling help stave off financial collapse in America? (2) Do you think it is only a stop-gap measure? A. (1) If so, only temporarily. (2) Precisely. Q. Do you think that Greece should default on its debts? A. It is not a question of ‘should’ but only a question of ‘when’. Q. What lies behind the explosion of violence in many places around the UK in early August 2011? A. Social injustice. The ever-widening gaps between the richest and the poorest. Bad housing, unemployment, vicious cuts in welfare and public services. The trigger to all of this social upheaval, which remains ready to erupt at any time, was the shooting, by the police, of a young man who was apparently armed (but the police later admitted that his gun had not been fired, having first stated that he had shot at them). People have lost trust in the police, have lost trust in Parliament and feel they have nothing to lose, and took the, to my mind, wrong step of burning and trashing their own communities and others. Q. Is it just a case of opportunistic criminality? A. There was an element of that, in the general excitement of destruction. Q. Would you be able to say to what extent the rioters are simply ‘trouble-makers’ and to what extent they are people with a genuine – conscious or unconscious – grievance in the face of unemployment, no prospects, extremes of poverty and wealth, social and economic injustice in general? A. As I have said above, it was a mixture of both. Q. What are the solutions to such situations? A. As ever, sharing and justice. Q. At the end of July 2011 over 100,000 Israelis took to the streets to protest against social injustice and the cost of living in Israel. Could your Master comment on whether this is the beginning of an ‘Israeli’ spring and will it lead to a fairer society in Israel, as well as – eventually – in Palestine? A. It is a start in the right direction. Q. Over a year ago the ‘Raj Patel incident’ lit up the entire media, proving that thousands of people around the world are alert to anyone who could possibly be Maitreya, incognito or not. Since then, despite that same vigilance, nobody has emerged who, rightly or wrongly, might fit the bill. If any multi-lingual Asian man (‘one of us’) had appeared on at least 38 TV panels, to huge audiences over the last 18-plus months, by golly they’d have spotted him by now! So why is there no media record of any such person? I know you’re fed up with these questions but if we cannot find a single trace of even his incognito persona, how can we possibly respond to his ideas? I empathize with your aims and want to support Share International’s work, but we need more adequate answers to these valid concerns, in order to help build the very consensus you seek. A. You are speaking for yourself. I for one, and many, many others who work with me, work hard to inform the public about the presence of Maitreya and the Masters, do not need the recognition of someone, real or unreal who “fits the bill”. I am informed by my Master that some 37 million people have heard this information in one way or another. Of these, about a third – that is say 12 million people – firmly believe in the story. Thousands of these worldwide work with me in making it known and understood. About a third, around 12 million, totally disbelieve this story and a further third, around 12 million are, like yourself, sitting on the fence, waiting for someone to be identified as Maitreya. Do you not think that if Maitreya wishes, as He does at present, to remain incognito, that He has not the intelligence to do so? When He does announce His true identity it will be on the Day of Declaration. We are not at that point yet. My advice is: wait for it. Q. There is a general economic crisis taking various forms across different parts of the world, and current leaders seem bereft of ideas. On the one hand they are printing money and on the other they are passing austerity measures. The financial organizations such as banks and corporations continue to be excessively powerful. What urgent steps should be taken now? A. There is only one way to solve our political and economic problems – to bring peace and prosperity to all. Only the acceptance of the Oneness of humanity and the implementation of sharing and social justice will give us the trust which is necessary for peace. Whatever financial manipulations we try, nothing will bring the peace which is necessary for survival that does not implement sharing and justice. Q. I would like to ask if possible, with all the changes expected the phrase ‘very soon’ and ‘imminent’ are mentioned quite a lot. I am 65 this year – is it likely that I will see some of the changes promised? Q. In the July/August 2011 issue of Share International there was a photograph of a Russian military helicopter transporting a UFO. (1) Was this UFO deliberately crashed? (2) Was it maintained in dense physical matter in order to give Earth scientists an opportunity to study the craft and learn from it? Q. (1) If nuclear fission is dangerous why was humanity allowed to develop such a dangerous technology? (2) Could the Hierarchy and the Space Brothers not inspire or help Earth scientists to develop fusion-based energy rather than nuclear fission? A. (1) In 1942 both the Allies and the Axis powers (mainly the Germans under Hitler) were striving ‘neck and neck’ to discover the secrets of nuclear fission. Hierarchy appealed to Sanat Kumara, Lord of the World on Shamballa, to permit the giving of this secret to the Allied powers (behind whom stood Hierarchy). This ensured the discovery of atomic fission ahead of the Nazis and led to the sooner ending of World War II. (2) Hierarchy and the Space Brothers have helped Earth scientists to develop nuclear fusion but it has not been taken up, to a large degree because of our commitment to oil and the current nuclear industry, worldwide. On the weekend 10-13 June 2011 I had a stand at a new age fair. Just after the opening on the first day a man came into the stand. He had a zip-up folder, used for carrying paperwork, under an arm. 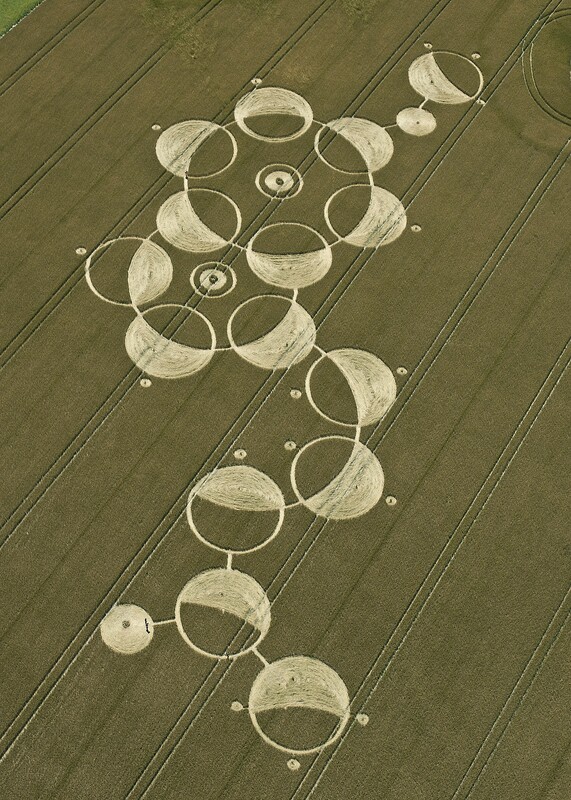 He stood looking at the poster with a collection of crop circles. I said that they are made by our Space Brothers from our neighbouring planets. They come mostly from Venus and Mars, some from Jupiter and some from a few other planets within our Solar System. “That’s right!” he replied. Then he asked if I have seen the latest ones. I said that there are so many I have not looked. He was smiling and had particular joyful eyes. It also occurred to me that he looked a lot like George Adamski, only perhaps younger than the photos I have seen. He then said that in the past four years many people went through a difficult period but are now feeling more light and peace within them. I said that was my experience also. He then added: “It has been a good four years, challenging, but good! Now we all have to get together to bring it out.” And he made a gesture with his hands – from within out into the world. He then said: “It will be difficult. Many are stuck.” He then looked joyfully at me once again, took a breath and said: “Got to run!” and quickly walked off. If possible, could your Master please confirm if this man was Maitreya. At the end of the outreach I spoke at on 31 July 2011, in Sebastopol, California, a Mexican lady and her young son (perhaps 7 years old) came up to me. He was very shy with his eyes looking downward. The mother said he wanted to tell me something if that would be OK, so I crouched down so my eyes were at his eye level. He said they lived on an island in Mexico and everyone in his town saw many glowing UFOs at the same time. He said when he told others who had not been there about this, they did not believe him. I asked him what it felt like for him to have experienced the UFOs and he said: “I felt very hot.” I replied: “Ahh, the heat of love.” When I said this he said: “Yes,” and looked so deeply into my eyes (for such a shy little boy) that I wondered if perhaps it was a Master, especially since he said he lived in Mexico and Maitreya is there now? On several occasions we have had sightings of UFOs near our home in Samnanger, outside Bergen. Lately, a repeated tendency has been that the morning after these observations, black unmarked helicopters have turned up and keeping circling around our house and the surrounding area. We suspect that a branch of military intelligence is behind this. On the 11 July 2011, I was on my way out from a drugstore in the center of Bergen. To my surprise, a man stood in the door hindering my exit, holding a supermarket trolley containing his belongings. The strange thing was that he looked exactly like the Swedish tramp with long, unkempt curly hair that I had seen in the city on several occasions. In fact, I was sure it was him. However, the odd thing was that he looked very clean, in spite of his filthy and shabby appearance. He did not appear smelly, but was surrounded by a nice fragrance of peppermint. He had blue, brilliant eyes and immediately the thought went through my head: “These eyes will nail me to this spot.” Then he gently touched my arm, looked me straight in the eyes and in a clear, quite low voice started talking to me in Swedish: “Are you under surveillance by the government? “Yes, yes,” I said rather hesitantly. Instinctively, I had the feeling that this man could be trusted. Then he asked: “Who are the true rulers of this country, is it the police and the military or the politicians?” I was flabbergasted, and at first was not able to speak. Then I answered: “It is the police and the military, one just has to look at what is going on in the US these days.” (I was especially thinking of the 30 people who were feeding the homeless in a park and were arrested for trespassing and the legislation that has just been passed here in Norway allowing the government to store all electronic communication.) I then told him about our UFO observations, and the story about the black helicopters that had been harassing us. It was as if he already knew, and that I did not have to say much. He nodded and seemed to agree to what had been said. (1) Was this a manifestation made by the Master Jesus or Maitreya, using the real tramp as a model? (2) His reference to the time is short, has that to do with the fact that all over the world civil rights seem to get restricted or even taken away and that we have to speak up against this before it is too late? While attending the 12 July 2011 Benjamin Creme lecture at Friends House in London, Mr Creme made the announcement that Maitreya was in the audience. Sitting in the first row, it was difficult to take a look around. After the lecture, when almost everyone had gone, a well-dressed, medium-built, dark-skinned man walked past and flashed such an unusually nice smile. Please would you be so kind to say if this man was Maitreya? And I must add, it was particularly rewarding to see Mr Creme lecturing again. I was in a baker’s shop in the town of Bingley in West Yorkshire on Thursday 30 June at around 12.30pm. In front of me in the queue was a small boy with blond hair of about 18 months old sitting in a push chair. His father was being served at the counter. I smiled at the toddler as I often do with small children and his reaction was quite astonishing. The smile he returned was like nothing I’d ever encountered before. It was as if a beam of the most powerful love I’d experienced came pouring out of him. This was so potent that within a couple of seconds I found tears pouring down my face and I was completely overwhelmed. To put this into context I’m a hardbitten 58-year-old journalist and an ex-war reporter not prone to such emotions. However, on this occasion something special seems to have happened. Can you offer any comments or explanation for this incident? T.W., Bingley, W. Yorkshire, UK. (Benjamin Creme’s Master says that the ‘child’ was the Master Jesus. His ‘father’ was a disciple of the Master Jesus). I was outside my house on the afternoon of 22 May 2011, in the backyard, looking at the sky. I thought to myself: “Wouldn’t it be great if I saw Maitreya’s ‘star’ or another spaceship again?” Then I thought: “Well, I have seen them many times. I think I already have the hope that they bring to people, so there is no sense in me seeing these spaceships anymore. In any case, I have seen them so many times, I don’t think I would be impressed anymore.” Then, the most amazing thing happened: I was looking at two small buildings that are near my house when a very luminous object began to circle behind them. The object emitted many different colours, red to blue, and sometimes yellow. It began to make some crazy manoeuvres near the buildings, going to the right and doing some loops. The object was completely silent, didn’t make any noise, which I think is impossible for a plane or helicopter, and the manoeuvres certainly were impossible for either. 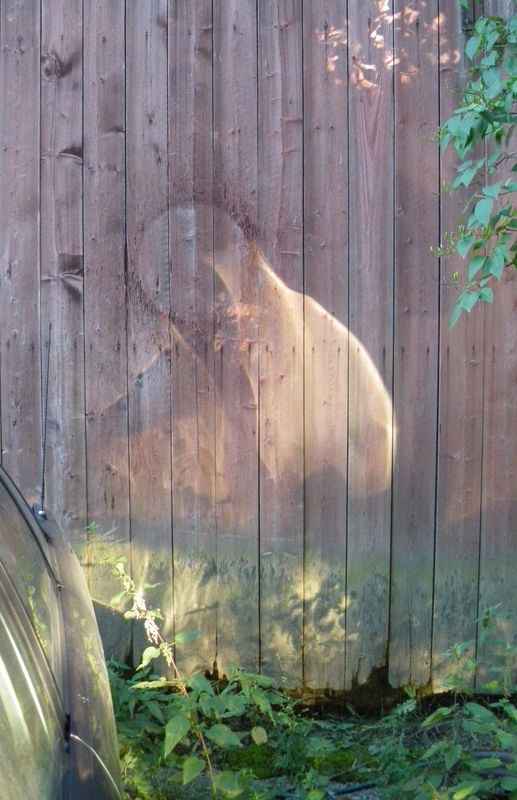 I ran inside my house to get a camera to take some pictures, but unfortunately, the camera had no battery, and when I returned to the backyard, the object had gone away. Could you please tell me if the object was a spacecraft? 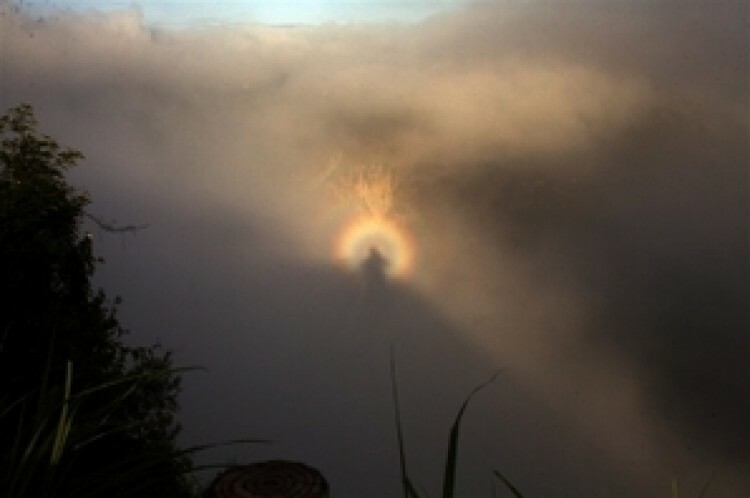 The light phenomenon known as the ‘Buddha’s Light’ appeared in June 2011 above the Yuntai temple on Yuntai Mountain outside Chongqing City, in Sichuan Province, China. Glowing with seven different colours, the circle of the “Buddha’s Light” appeared in the west while the sun was still rising in the east, and lasted about half-an-hour. 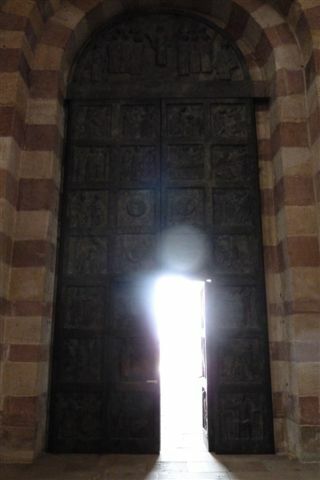 This photograph taken on 19 June 2011 in Speyer Cathedral, near Heidelberg, southern Germany, shows a light image confirmed by Benjamin Creme’s Master to be manifested by Maitreya. 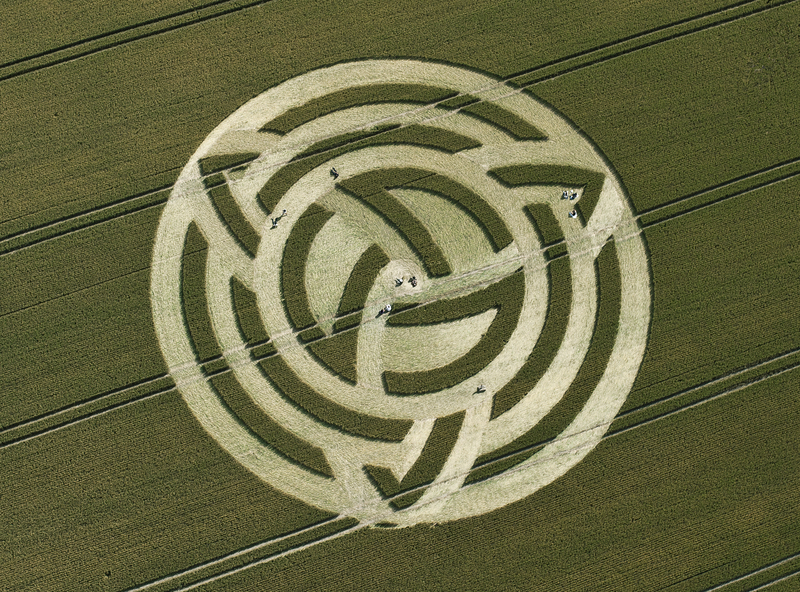 Four of the latest crop formations created in cereal fields in the UK. 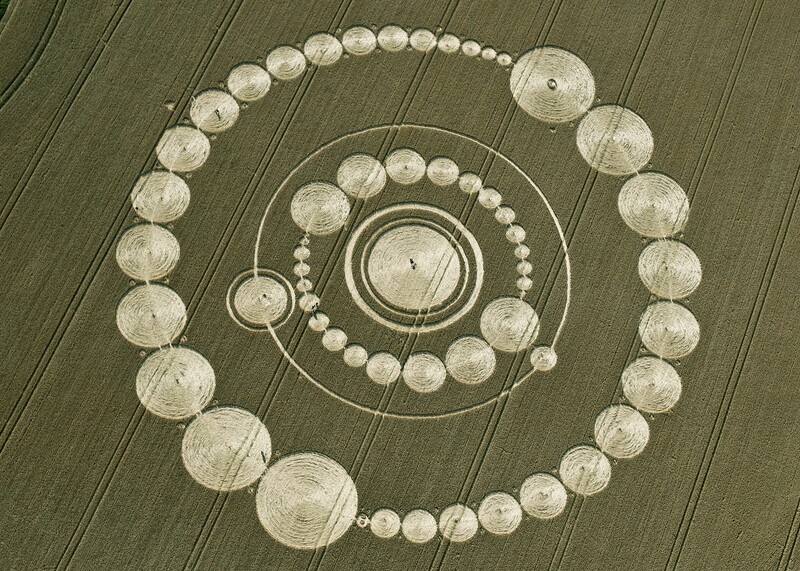 Benjamin Creme’s Master confirms these formations were created by spaceships from the planet Mars. USA, Mauna Kea, Hawaii – Reported in June 2011, footage of an incredible bubble-like burst of light in the night sky was captured by cameras mounted on the Canada-France-Hawaii Telescope on Mauna Kea, Hawaii. Captured in time-lapse footage, the glowing sphere takes several minutes to expand until it virtually fills the frame – then it vanishes as mysteriously as it appeared. 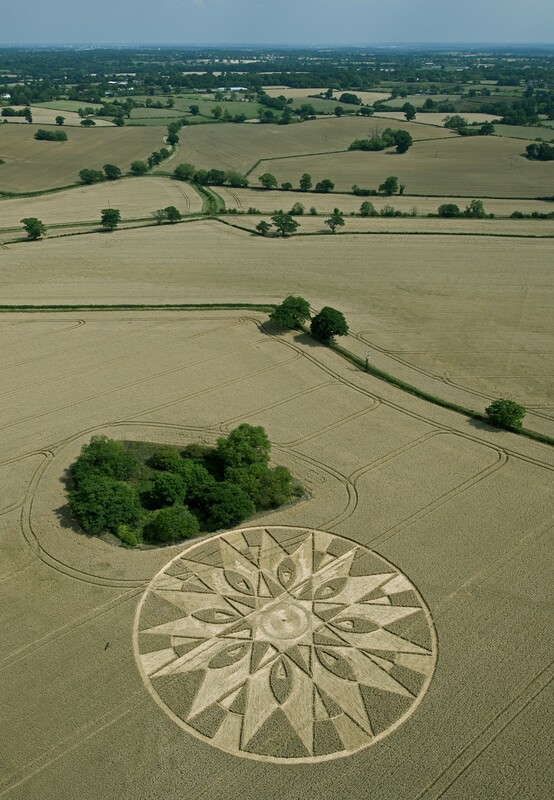 UK, Cottered, Hertfordshire– On 3 August 2011, Mike Sewell, BBC Radio 5 Live’s sports reporter, was driving from his home in the Midlands to catch an early morning flight from Stansted airport when he saw “a big disc, round-shaped craft” over the village of Cottered, near Buntingford, Hertfordshire. He called Radio 5 Live, and his interview with presenter Nicky Campbell was broadcast to millions of listeners. He said: “I was probably about 15 or 20 miles from Stansted at 4.15am and there was this big bright light in the sky descending towards the road. As it got closer it banked to the left, and as it banked … and went across the countryside I could see underneath it. It wasn’t an aeroplane, and it wasn’t a helicopter. Certainly a kind of – and I dread saying this – disc shape. It had several lights flashing all around it. Underneath there were at least two large panel lights, soft white lights, and then it just sat or circled a certain area above the field for a few moments. Immediately after Mr Sewell’s interview, Nicky Campbell took a call from UFO expert Timothy Good. Gulf of Bothnia, Baltic Sea – A team of Swedish treasure hunters specialising in recovering antique wines from deep-sea wrecks have found an extraordinary object on the floor of the Baltic Sea. On 19 June 2011, Peter Lindberg and his Ocean Explorer crew saw sonar images of a disc-shaped object lying in mud 285 feet deep in the Gulf of Bothnia, in the Baltic Sea. The object is 65 feet in diameter, with what appear to be impact tracks 985 feet long leading up to it. We present a selection of quotations on the theme of ‘Courage’ from Maitreya (Messages from Maitreya the Christ), Benjamin Creme’s Master (A Master Speaks), and Benjamin Creme’s writings. Maitreya knows already those on whom He can depend. He knows that the hearts of men are sound and strong, on them He can rely. He knows that His army is ready for the good fight for the Common Good. That the men and women of Goodwill everywhere are sensing His presence and responding to the world’s need. [The Master Djwhal Khul] also says that all disciples must have courage, first and foremost. The world will never get rid of illusion until we have courage. One of the duties of true disciples, says DK, is to speak out openly against whatever authority exists in the world – scientific, religious, political or any level – with which we disagree and see further and clearer than it does. My friends, I am nearer to you than you may think. My heart beats step by step with yours. My heart cries for the suffering of so many. Yet I know that the hearts of those who hear Me now are open and willing to help. Fear not My friends. Give bravely and willingly to help all in need. When you do this you enter that area of divinity from which you come. This is the action of divinity itself. Man has the future in his hands. Weigh well, oh men, and if you choose as true men would, I may lead you into the Light of your divine inheritance. Make your choice well, and let Me lead. Make your choice well, and be assured of My continuing succour. Make your choice well, My brothers, and be delivered of all that holds you in limitation. When Our faces are seen, you will see also the beginning time of changes which will transform the world. Not all at once will the changes take place, but soon the first firm blows for justice and freedom will be struck, gathering momentum as the months and years flash by. In time, all will be renewed and the peoples of the world will breathe a cleaner and a saner air. 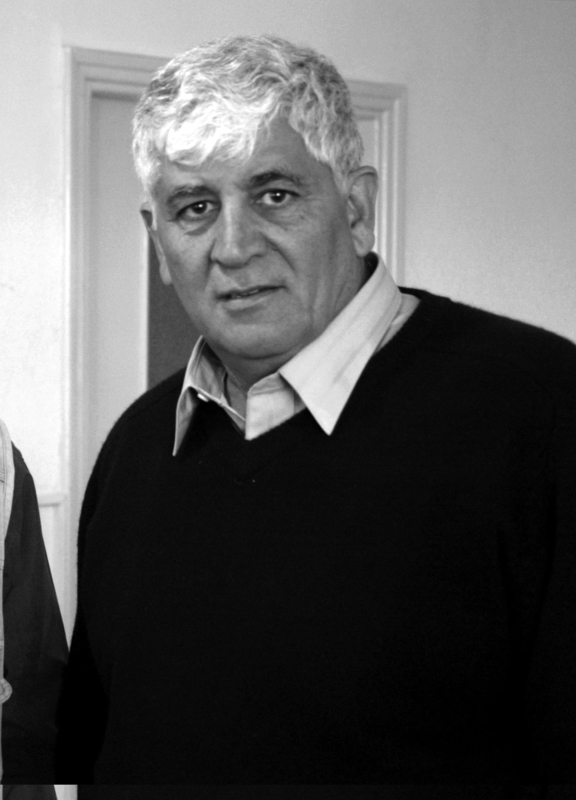 Mubarak Awad founded Nonviolence International, a Washington DC-based nongovernmental organization, in 1989, after being expelled from Palestine for helping to create a nonviolent action campaign and the first intifada. Nonviolence International is a decentralized network of resource centers that promote the use of nonviolent action worldwide. Awad has also spent the past 30 years as a youth advocate, and created many programs that provide services to troubled and neglected youth throughout the United States. Jason Francis interviewed Mubarak Awad for Share International. Share International: Should violence such as terrorism, insurgencies, and guerrilla warfare ever be adopted to achieve political ends, even if that end is laudable such as bringing about freedom and justice from an oppressor? Mubarak Awad: I do not believe in terrorism. I do not believe in violence even against a brutal dictator. A dictator sees himself as one person, but he has other people who keep him in power. He has the military, the banking system, the police, security, and others. In nonviolent action, it is not that we have to kill those people but rather try to convince them not to support the dictator because it is in their best interest and the best interest of the community and the nation they are serving. That idea was very strong in the great revolutions that have just taken place in Egypt and Tunisia. And there are going to be changes in a lot of places. People at this time, because of their higher education, don’t need to hide behind the bomb or putting belts of dynamite around themselves and killing. It doesn’t work. SI: If the Palestinian community had built a nonviolent resistance movement similar to the one inspired in India by Mahatma Gandhi, or in the US by Martin Luther King Jr, do you believe the international community, especially the US (Israel’s largest benefactor), would be less willing to overlook Israel’s occupation and oppression of the Palestinians, and take a much more determined stand against Israel than we see today, or would that not make any difference? MA: When Israel was created, and then after the Six-Day War in 1967, Israel became a unique concept in American society – not only in the government but also in churches and school systems. There is nothing that parallels the relation between Israel and the United States in any other place. So it doesn’t matter if the Palestinians use violence or nonviolence. It is not going to change the US concept of Israel at all. The only changes that can happen are when Israeli citizens accept the concept that they have to make peace with the Palestinians. Then the United States will follow. As long as Israeli citizens are unable and unwilling to make peace with the Palestinians, the United States will continue to be on the side of Israel. And this is true of both the left and right in US politics, so it doesn’t matter who is in office. Saying that, it is obvious that when there is violence against the Israelis (and there are many reasons why that is happening), that will trigger more action from the United States to accept the rigidity of the Israelis. But if there is a lack of violence, there will be a little bit of change. For many years in the Israeli-Palestinian conflict there wasn’t a single terrorist act and there was no change on the Israeli side. Then there would be violence and there would be no change. So I am not very hopeful for that situation to change. However, if you look at South Africa, no one ever thought there would be change and change happened. If you look at the Soviet Union, no one ever thought it would collapse without a fight, guns or war, and it collapsed; the same thing in Northern Ireland; the same thing also in the United States with the Civil Rights movement. The white people on the side of justice in South Africa made the change. The British made the change in Northern Ireland. The white people in the United States made the change during the Civil Rights movement. So whenever change happens it happens from the stronger side rather than the weaker side. In the Palestinian-Israeli conflict the stronger side is Israel. They have to look at other places and see that change has to happen. SI: How does a group use nonviolence to achieve social changes? MA: First, we have to look very clearly at the concept of human rights. When a person has their human rights taken away by another person, and they are so weak they cannot defend themselves and get their rights back – children’s rights, women’s rights, political rights – then we must have someone else who feels it is their responsibility to fight for the rights of those people, even if they do not know them. You find an American fighting for rights in Nicaragua, an American or a British person fighting for the rights of the Chinese, someone from the Netherlands fighting for the rights of the Palestinians. They don’t need to know the person but they feel that in a society of people nobody should deprive someone else of their rights. And when those rights are taken away, we have to do something about it – through the use of nonviolence. We cannot kill others because they deprive someone else of their human rights. That’s the weird thing with capital punishment. The state says, “Well, because you killed this person we have to kill you.” We know that killing is wrong no matter what, no matter who does it. When we put the concept of nonviolence into practice, we try to see the other side’s concern and fear, why they are doing what they are doing. We let them understand we are not going to harm them, but also that what they are doing is harming others. That’s how a lot of the activities of nonviolence take place. There are dictators who say: “Everyone loves me. I am the one who is summoned by God for his people.” Then he finds there are thousands of people in the street rejecting him and telling him, “Get out, we don’t love you.” So he has to make a decision: “My gosh, I thought I was loved by everyone. Why are there thousands of people in the street and they don’t love me? So I’m quitting.” That becomes the power of nonviolence – not just as an individual but as a group, thousands and thousands of people who commit themselves to make that change. Nonviolence has to be taken seriously. We cannot take it lightly like in the United States where it is only a weekend activity. Before the war started in Iraq, there were thousands and thousands of people who came to Washington DC on the weekend and then they left. But if those thousands and thousands of people stayed day and night in Washington DC and blocked the government, blocked the streets, blocked everything in Washington DC, then politicians would really understand that those people do not want war in Iraq. But after Sunday everybody goes home. They say: “Well, we protested not to have war in Iraq.” It was a weekend commitment rather than a commitment to be in the street for six months or even three months, whatever it takes. We have to live in the street until change happens. For example, Washington DC does not have a Senator but they pay taxes. The people who live in Washington DC accept this as a defeat and they live in it everyday. However, we don’t see thousands and thousands of DC residents refusing to pay taxes. If everybody in DC refused to pay taxes until they had a Senator then the government would change. One, two, ten or twenty or a hundred people won’t work. It has to be a great number of people to make that change…. SI: Could you describe your work with young people? MA: I can begin by saying that my father was shot and killed during the Arab-Israeli war. I lived in an orphanage, becoming a burden on society, and it wasn’t my fault. I felt that children should not be deprived at all because of the death of their parents. In my youth I went to bed hungry so many times, and I felt this was sad. When I came to study in the United States I saw many people hungry. I saw many children who were 12, 13 and 14 years of age behind bars. In my studies at the university I felt there was something wrong in a society as rich as the United States that doesn’t know how to deal with these children. So I started taking children from jails and institutions, and tried to work with them in their own homes, to find relatives for them to be with rather than institutions, jail or foster care. I felt so blessed that many people agreed with me. We started an organization, and part of the organization uses spirituality with young people, teaching them that they are not a burden on society. We have to help them be a part of society. We put them back in school, we put them back to work, and it is always a joy to see that some of them are succeeding in life. I started in Ohio and people wanted to start sending us children from Indiana and West Virginia. We said: “No, we will go to West Virginia and Indiana and solve problems there.” Now we are in nine states with a budget of more than $50 million. We are helping so many children and families, and are proud of the work that we have been doing. MA: You have to look at the power of nonviolence now in the Middle East. It is going to change the whole concept of people getting what they want as a matter of empowerment. You also have to look at education. I teach at American University in Washington DC and one of our largest sections at the university is Peace Education. We have more students coming to Peace Education than engineering or any other discipline. In almost every university they are teaching conflict resolution, nonviolence and peace studies. Five, ten, fifteen years ago that was not happening. We are changing our education, and this is essential if we are ever going to come to a point where we don’t need to fight and destroy each other. The third United Nations Conference on Trade and Development (UNCTAD) Public Symposium took place on 22-24 June 2011 at the Palais des Nations in Geneva.Groups from the civil society joined UN organizations staff and state representatives for three days of discussions on “making trade and finance work for people and the planet”. Luc Guillory, a Partage International co-worker, attended on behalf of Share International. In his introductory speech, UNCTAD Secretary-General Doctor Supachai Panitchpakdi highlighted the need for a new structure for international co-operation. “We need a holistic approach” he said, because “development must be sustainable and inclusive, it must be the priority on the agenda”. He noted that humanity is not taking the right direction at the moment and that, quite apart from solving global problems, we are actually experiencing a deterioration of the world situation. Statistics show that there was some growth in the aftermath of the economic and financial crisis of 2008, but that was true mainly for Asia and East Asia. There is no real trend of recovery for nations and people, whereas, he remarked, the banks’ wealth increased by 9 per cent during the same period. What is particularly significant is that bonuses in the higher echelons are back to a very high level. “There is a conspiracy among the banks,” the UNCTAD Secretary-General said, in connection with the absolute refusal by banks for any serious control over and regulation of their activities. Meanwhile state debts have become “more than exorbitant” and re-profiling the debt is an absolute necessity, but nobody knows how to do it, he said. Panellists agreed that the US dollar is losing its value every year because of the unsustainable $14,000 billion US national debt, but no serious initiative is taken to tackle the problem – a very worrying situation at a time when the need for equitable income distribution, extreme poverty reduction, job creation, gender equality, social protection and low carbon opportunities for development are critical. Heidemarie Wieczorek-Zeul, member of the German Parliament and former federal minister for Economic Co-operation and Development, expressed her dismay that following the recommendations by the Stiglitz Commission, there had been no follow up. In particular, she pointed out, the G20 is not making any progress in regulating the international financial system, while most of the latest figures, confirmed by Dr Supachai, show that US$11.4 trillion were spent saving the global banking system after the 2008 crash. Who pays for the damages? she asked. Austerity measures and policies are being enforced in almost every corner of the world so it is quite obvious that it is the ordinary citizens who have been ‘chosen’ by the banks to pay the bill for their follies…. Panellists agreed that the lack of financial regulation plus blind faith in market efficiency is at the root of the crisis. Dr Supachai would like to see more G20-UN co-operation; the UN system must be strengthened for more effective global governance. Unilateral behaviour on the part of governments is not acceptable, with new threats on the financial horizon. Fundamentally, explained Chandran Nair, founder and chief executive of Hong Kong’s Global Institute for Tomorrow, the idea of “‘less’ is at the heart of the ideal of sustainability”. We deny the fact that we live in a finite world and we reject restrictions, but there are only limited resources, he stressed. A new and ‘green’ economy must be different, based on human rights (“to own a car is not a human right,” Nair exclaimed to the audience), good quality jobs and participation. However, the dominating market forces will not be the vehicles for change, nor are the existing related institutions likely to be. According to the United Nations Development Program (UNDP), the richest 20 per cent of people owned or controlled 82 per cent of the global wealth in 1994, but by 2009 that figure had risen to 91.5 per cent. Concluding the Symposium, Petko Draganov, deputy Secretary-General of UNCTAD reminded the audience that we “stumble from one crisis to another” with political short-termism. UNCTAD President Luis Manuel Piantini Munnigh said that key events and meetings such as the Rio+20 meeting in June 2012 and the UNCTAD XIII meeting in Doha, Qatar, in April 2012, will be milestones to pave the way to a much needed transition. Civil society is invited to take part in those events and make their voice heard. Spain – The Spanish protestors, the ‘Indignados’ [‘the Indignant’], have left their main stronghold in Plaza del Sol in Madrid to broaden the movement and bring it closer to the people. They are walking to the heart of Europe to rally support and collect proposals petitions in preparation for a major European-wide rally on 15 October 2011. “Vamos despacio porque vamos lejos” – we’re going slow because we’re going far – read banners as they set out on an epic 1000-mile march to Brussels in Belgium. The march is a continuation of the marchas populares indignadas which converged on Madrid in August 2011 after departing from dozens of cities all over Spain. There is now a new organization in the main neighbourhoods of major cities that is learning about the needs of the people and providing support to people locally. For example, they are working with people who have been served with eviction orders due to their inability to pay the mortgage. When the police and bank representatives arrive to evict them, they find hundreds of ‘Indignados’ blocking their way. Faced with this sight, the representatives turn away and the eviction is prevented. Protestors say they are marching because they are angry at the way the economic crisis is playing out in Europe, with spending cuts, job losses, and privatizations, while those they blame for the recession remain unaffected. By going to Brussels the protest will be taken to the level of the European Union. The marchers are scheduled to arrive in Brussels on 17 September, where they will be joined by ‘indignants’ from all over Europe for a major demonstration as part of a European-wide day of action. Then, starting on 8 October, a week-long Social Forum will be held in Brussels and rounded off with a major demonstration on 15 October as part of a day of global action. In late July and August 2011 Israelis took to the streets to protest about the rising cost of living: low incomes, expensive housing prices and rents, the high cost of raising children and other social issues. On three consecutive Saturdays protests drew the biggest demonstrations the country had seen in decades. On 13 August the marches spread to 12 cities including Tel Aviv, Jerusalem and Haifa, and tent villages sprung up, with many people living on the main boulevards, surrounded by banners and flags, reminiscent of the Tahrir Square demonstrations in Cairo, Egypt. In early August the largest protest was in Tel Aviv where at least 200,000 people took to the streets, while 30,000 people marched in Jerusalem. For a nation of 7 million people, the numbers demonstrating were very high. Although the protests began over the high cost of renting and buying homes, the dominant slogan on recent demonstrations has been “the people demand social justice”. The demonstrators are made up all types of Israeli people and now also include Arab Israelis, who make up 20 per cent of the population. In Haifa, Hamoudi Hujeirat addressed the crowd, calling for co-operation between Jews and Arabs. “We are one people”, he said, to the cheers of the crowd. Writer Sami Michael told the crowd in Arabic: “At age 85, it’s hard to be optimistic but the younger generation today makes me feel optimistic. Today the public is showing for the first time a connection between classes, between cities and villages, between Arabs and Jews, and I don’t remember anything like this in Haifa. The impact of the Middle East has reached us, too,” he said.